Robert Carmon had a rough start to life. Shortly after birth he developed asthma, a chronic disease that causes inflammation in the lungs and difficulty breathing. His attacks were so severe as an infant that his parents rushed him to the emergency room practically every week. They were terrified he might die. Today, at age 7, Robert’s asthma has stabilized. With the help of his dad, Chaz Carmon, he inhales a steroid-based medicine each morning and evening, and he carries a rescue inhaler in his backpack in case an asthma attack comes in school or elsewhere. 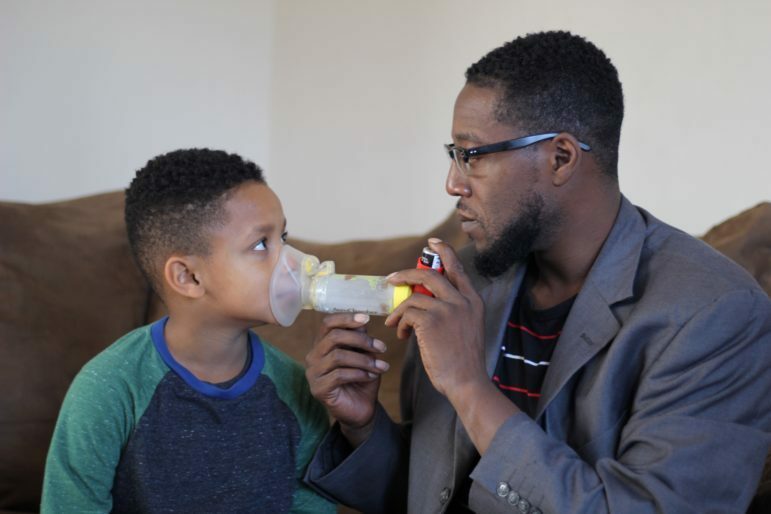 Robert Carmon, and dad, Chaz demonstrate the inhaler used twice daily to control Robert’s asthma. Connecticut’s asthma rate is worse than the nation’s. It’s 11 percent for children and 10.5 percent for adults—and rising. Neighborhoods in Bridgeport, Hartford and New Haven are among the hardest hit. Automobile exhaust, cigarette smoke and mold and vermin in sub-standard housing are among the triggers. “Your ZIP Code matters. It’s a determinant of health,” said Marie-Christine Bournacki, coordinator of the asthma program for the Connecticut Department of Public Health. In Hartford’s North Meadows neighborhood, for instance, asthma in children from birth to age 4 accounted for 1,738 visits to hospitals per 10,000 residents in 2016, according to DataHaven. In comparison, the rate in Madison, a wealthy coastline town, was just 78. The median household income in Madison is $108,231; while in North Meadows it’s $20,434. In the past year, Connecticut Children’s introduced a new process for treating patients more quickly—by having nurses engage with them soon after they arrive. Previously, it took an average of 75 minutes to treat asthma patients. Now it’s 34 minutes—and the goal is 20. “Kids come in struggling to breathe. To be able to immediately treat them and see a quick turnaround is pretty amazing,” said Eric Hoppa, a pediatric emergency attending physician at Connecticut Children’s. 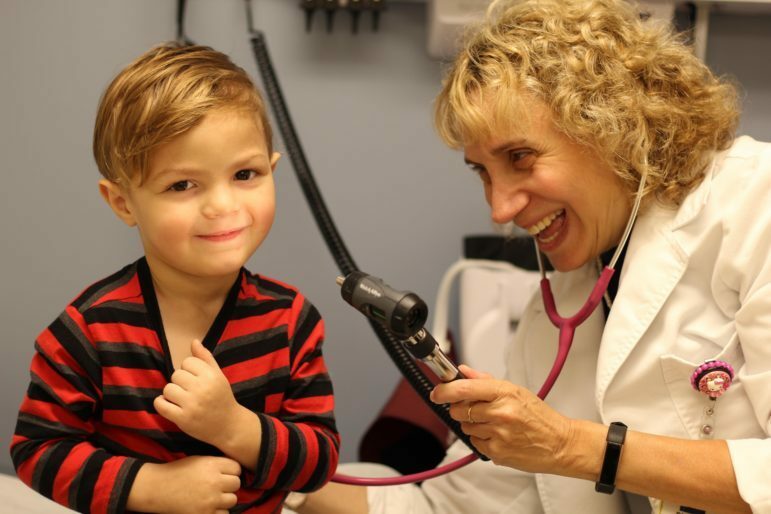 Marc Maldonado, 2, from Fair Haven Heights, is examined by Dr. Pamela Kwittken, pulmonary specialist at the Fair Haven Community Health Care asthma clinic. In New Haven, Fair Haven Community Health Care opened its new Respiratory, Airway and Allergy Clinic (RAAC) in June. It’s staffed by a physician who is certified in treating allergy and asthma, an occupational health specialist, a nurse and a care coordinator who investigates the social determinants of each patient’s asthma. The goal is to help them make adjustments in their lives that will reduce triggers. All of the health center’s patients diagnosed with asthma, and those who show signs or symptoms, are referred to the clinic, which is one of a few of its type in greater New Haven. Asthma can impact children’s lives catastrophically. “If they’re not treated properly, they miss a lot of school; they sit at home and play electronic games and don’t socialize; and they don’t go outside to exercise and get fresh air,” said Dr. Pamela Kwittken, the physician at Fair Haven’s RAAC clinic. The next step for the Fair Haven clinic is forging a formal partnership with Milford Health Department’s Putting On Airs, part of Connecticut’s home asthma education program, which helps asthmatics and their families follow action plans and reduce the triggers in their homes. 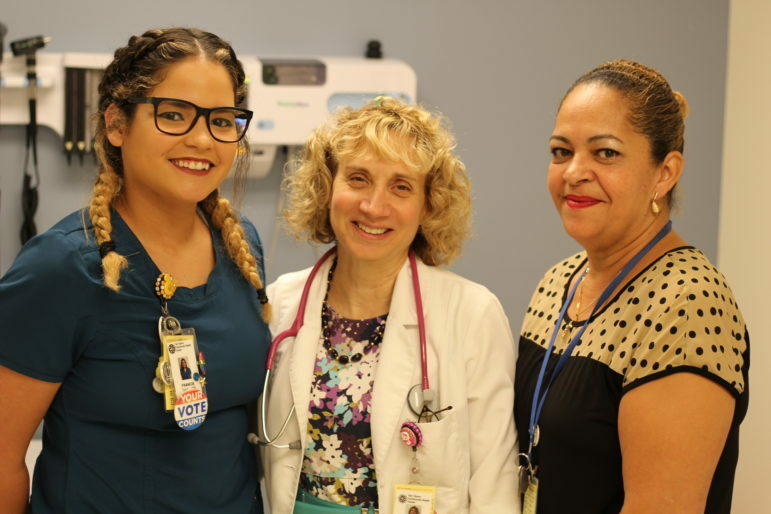 The staff at Fair Haven’s asthma clinic includes Fran Torres, a nurse, Dr. Pamela Kwittken and Nancy Arvelo, care coordinator. Under Putting On Airs, teams of health workers conduct a series of three home visits with asthma sufferers. The teams typically include a health educator, who makes sure inhalers and other medications are being used properly, and an environmentalist, who looks for dust-mite-infested carpets, moldy bathrooms, mice and cockroaches. One Bridgeport family kept canceling appointments with Putting On Airs. Language was an issue. Seguinot visited the mom on her own and learned that she didn’t understand the asthma action plan nor how to administer medications for her daughter on a regular basis. After Seguinot explained things carefully and helped with scheduling, the mom was able to follow the plan and became more comfortable with additional visits from the team. “It’s important to have somebody that these families can relate to. It might be language, culture, ethnicity or even physical appearance,” Seguinot said. One of the reasons for Connecticut’s high rate of asthma is that much of the urban housing stock is more than a century old, and many urban people live in rentals (72 percent in New Haven). Old buildings tend to harbor asthma triggers, such as mold and dust mites, and landlords are often reluctant to replace carpets where dust mites hang out, or to repair faulty exhaust fans. Alice Rosenthal, staff attorney for the Center for Children’s Advocacy, recounts a success story in New Haven that provides a blueprint for others. A 12-year-old boy with severe asthma lived with his mom and two siblings in a rundown apartment where grimy old carpets covered the floors. His mom vacuumed the carpets frequently and even paid to have them steam cleaned, but it wasn’t enough. She asked repeatedly for the landlord to remove them. No go. Finally, after the boy’s primary care doctor, a pulmonologist and Rosenthal wrote letters urging the landlord to take action, he did so. “Now, the boy is not missing school and, because he’s healthier and using less steroids, he can get outside and play sports,” Rosenthal said. Plus, because the mom doesn’t have to be at home all the time, she’s now working—and the family is doing much better economically. Rosenthal coordinates a partnership with Yale New Haven Children’s Hospital where the two organizations collaborate on addressing the social determinants of health. This story was first published by the Connecticut Health Investigative Team, C-HIT.org.